you probably need to "load" the plough. Put it on the ground, drive a tiny bit and you will see the crossshaft will turn a little. Then you can lift the plough and use the handle to turn it. I will see If I can upload the manual of my tsr 107. I think it's the same mechanism. ok i have a book for it, this is the first reversible plough i have had and it has needed a bit of work, there is a ratchet pawl in the turnover mechanism this was seized, i have got this freed off and will try it again on the tractor, it is an international 584 that i am using this on and it struggles to lift it high enough for the plough to turn over without hitting the ground, how will this work for ploughing as it is close to 23inches from the tip of the point to inside of the back tyre am i right in thinking this should be 12", i would need to keep the centre of the tractor on top of the previous furrow for it to plough properly? You will need to get your plough as high as possible, sometimes it can help by driving the front wheel in the furrow and then hit the handle to turn the plough. Can you make a picture of your setup? we use https://postimages.org/ to upload the pictures and host them here. Did you see that there are YouTube videos of a plough like yours, https://www.youtube.com/watch?v=2CNIHuBOPB4 and did they help you? He seems to be taking an enormous furrow, both deep and wide, so your measurement may well be right. I would think he has his 135's wheels at 56" centres, or maybe less, so that would be the first thing I would check. The Massey 65 in your photos looks about right. I had a 2-furrow 84 and then a 102 which were basically the same, with the same turnover mechanism, which is slightly different to yours. Can you give us a close-up photo of the front of the plough? That rod pointing forwards is part of the turnover mechanism and should be attached to something, but I can't see the part where I would have expected it to be attached to. I used my 102 with an International 475 which is very similar to your 584 and it worked fine, so I don't think the tractor is your problem. If it doesn't lift high enough you should be able to shorten the lift rods. 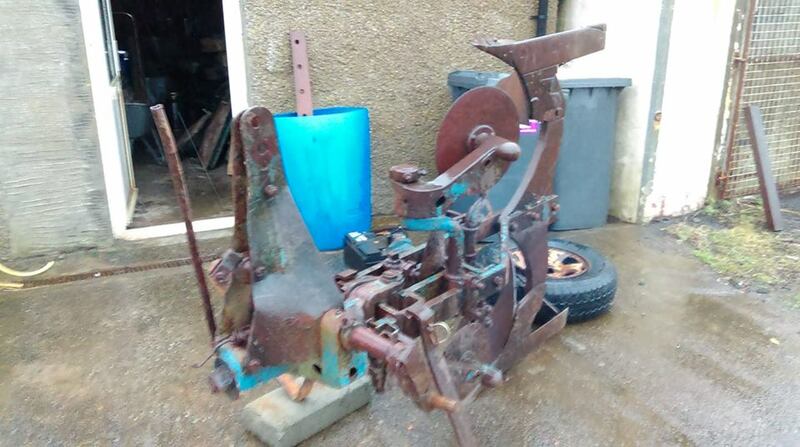 Sorry I can't be more help, I haven't used or even seen, a Ransomes single-furrow reversible, but I get the feeling there are some parts missing from the front of your plough. 1335674 - err - one day.. The Fordson Tractor Pages. Built to be relied on.